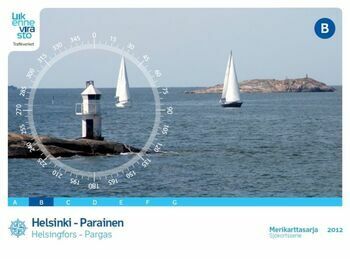 Charts of Finland can be used by both professional and recreational mariners. It provides the user with the information on the nature of the coast and sea bed, water depths, main aids to navigation and landmarks, port approaches, marine hazards etc. Folio B: Helsinki-Parainen. Scale 1:50.000, special charts on back sides of sheets 1:25.000 or 1:20.000. Also included two sheets in scale 1:250.000, one for the passage from Hanko to Haapsalu, Estonia and one for the passage from Helsinki to Tallinn. Mercator projection, WGS 84 coordinates. 50, 20, 10, 5 and 3 meter depth curves. Inner archipelago yachting lanes, guest harbours and other useful information included. Size: 46 cm x 34 cm, Weight: 0,95 kg. 68 pages, ring bound, PVC protective wallet. Published: 2012. Charts of Finland can be used by both professional and recreational mariners. It provides the user with the information on the nature of the coast and sea bed, water depths, main aids to navigation and landmarks, port approaches, marine hazards etc. Folio A: Viipuri-Helsinki. Scale 1:50.000, special charts on back sides of sheets 1:25.000 or 1:20.000. Includes two sheets in scale 1:100.000 for the passage from Finland's border in the east to the city of Vyborg in Russia plus one sheet in scale 1:250.000 for the passage from Helsinki to Tallinn, Estonia. Mercator projection, WGS 84 coordinates. 50, 20, 10, 5 and 3 meter depth curves. Inner archipelago yachting lanes, guest harbours and other useful information included. Size: 46 cm x 34 cm, Weight: 0,85 kg. 66 pages, ring bound, PVC protective wallet. Published: 2008. 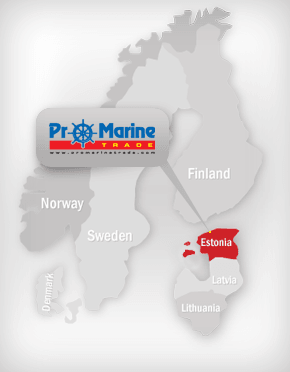 Charts of Finland can be used by both professional and recreational mariners. It provides the user with the information on the nature of the coast and sea bed, water depths, main aids to navigation and landmarks, port approaches, marine hazards etc. Folio C: Aland. Scale 1:50.000, special charts on back sides of sheets 1:25.000 or 1:20.000. Also included a sheet in scale 1:250.000 for passage of the Sea of Aland (between Swedish mainland and the Aland Islands). Mercator projection, WGS 84 coordinates. 50, 20, 10, 5 and 3 meter depth curves. Inner archipelago yachting lanes, guest harbours and other useful information included. Size 46 cm x 34 cm, weight 1,05 kg. 80 pages, ring bound, PVC protective wallet. Published: 2011. Charts of Finland can be used by both professional and recreational mariners. It provides the user with the information on the nature of the coast and sea bed, water depths, main aids to navigation and landmarks, port approaches, marine hazards etc. Folio D: Turu Island. Scale 1:50.000, special charts on back sides of sheets 1:25.000 or 1:20.000. Also included a sheet in scale 1:250.000, depicting the network of major small craft tracks in the archipelago. Mercator projection, WGS 84 coordinates. 50, 20, 10, 5 and 3 meter depth curves. Inner archipelago yachting lanes, guest harbours and other useful information included. Size 46 cm x 34 cm, weight 1,1 kg. 82 pages, ring bound, PVC protective wallet. Published: 2010. Charts of Finland can be used by both professional and recreational mariners. It provides the user with the information on the nature of the coast and sea bed, water depths, main aids to navigation and landmarks, port approaches, marine hazards etc. Folio F: The Quark. Scale 1:50.000, special charts on back sides of sheets 1:25.000 or 1:20.000. Mercator projection, WGS 84 coordinates. 50, 20, 10, 5 and 3 meter depth curves. Inner archipelago yachting lanes, guest harbours and other useful information included. Size 59,5 cm x 42 cm, weight 0,8 kg. 36 pages, ring bound, PVC protective wallet. Published: 2006. Charts of Finland can be used by both professional and recreational mariners. It provides the user with the information on the nature of the coast and sea bed, water depths, main aids to navigation and landmarks, port approaches, marine hazards etc. Folio G: Bay of Bothnia. Scale 1:50.000, special charts on back sides of sheets 1:25.000 or 1:20.000. Mercator projection, WGS 84 coordinates. 50, 20, 10, 5 and 3 meter depth curves. Inner archipelago yachting lanes, guest harbours and other useful information included. Size 59,5 cm x 42 cm, weight 1,0 kg. 46 pages, ring bound, PVC protective wallet. Published: 2006.